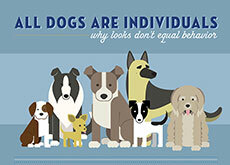 Please note visual breed identification in animals is unreliable. So for most of our rescue animals we are only guessing at the breed or breed mix. We feel it is most important to get to know each animal as an individual and will do our best to describe each of our rescues based on personality, not by breed label. Please click link below to learn more.